Just because something is space saving it doesn’t mean that you have to compromise on its comfort or function. Wall beds are space saving, there is no doubt about that, when its closed it has virtually no impact on the available floor space in your room, the typical footprint of a wall bed is just the depth of the cabinet, always less than 45cm and often much slimmer. Naturally, with something so sleek you might expect the mattress to be very thin, after all it has to fit inside the cabinet along with all the bed mechanism etc. Most wall bed designs have a limited range of mattresses that will fit within the wall bed usually they are not more than 18cm deep, not that there’s anything wrong with an 18cm mattress, but the choice you get is quite limited and often you’re tied to buying the mattress from the wall bed retailer. As with all the products in the furl range, we approach things a little differently, we’re able to do this because we make everything we sell (there are a few exceptions) so can put a lot of thought into the design, function, its daily use and the durability of every new product we introduce. The Furl wall bed at first glance looks like any other high quality wall bed online but take a closer look and you’ll see some subtle differences which add to the comfort that you’ll really appreciate. Our wall beds are suitable for any mattress size, type and depth. You are not limited by the standard 18cm mattress most wall beds are designed for. 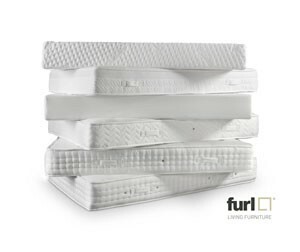 so yes, you can have a 20cm, 25cm and deeper pocket sprung, latex or memory foam mattresses in your wall bed. Having made storage beds since 2007, we know a lot about quality beds design and the support structure needed under the mattress, we know what makes a bed comfortable. We decided to use the tried and tested sprung slated system in our wall beds, the birch slats are gently sprung to work with your mattress. Our slats are adjustable so you can adjust the firmness under the lumbar area of your mattress, naturally each sleeping side can be adjusted independently. We never liked the straps that hold the mattress on wall beds, they prevent you being able to make the bed properly or tuck in the sheets, we also don’t like the fact you can feel them under the bedding when you’re sleeping, we had to find a better more practical way to secure the mattress to the moving frame. So, without divulging too much detail here, the furl wall bed is strapless, we’ve designed a clever way to hold the mattress in place that you don’t see or feel. Like our storage bed and sofa bed designs, space saving is at the heart of everything we do, why should furniture take up more space than it needs to? Our storage beds have very slim frames so that they take up as little space in the room as necessary and the same applies to our wall bed, the frame of the cabinet has been made as compact as possible, our frames are just 30mm thick which both save space but also looks (and is) very solid. Conserving space does not mean you have to sacrifice comfort! In order to get a good night’s sleep, you need a comfortable quality mattress on a sturdy well supported frame. Make the most of your space with a wall bed from furl, come and see the range at our London showroom.